Is a 10% Intra-Year Drop Normal? At the lows this year, the S&P 500 was down by 10.5%, which begs the question, how normal is this? Going back to 1928, the average intra-year low is to be down by at least 10.9% at one point. So it is not unusual to see the kind of lows we’ve experienced so far in 2016. Remember though, the panic and worry we saw near those lows was anything but normal. The average S&P 500 annual price return is 7.4%, with a median return of 10.5%, and 64.7% of all years finished positive. 39.7% of all years were down by at least 10% at their lows. 45 years gained at least 10%, while 19 years dropped at least 10%. 35 years were lower by at least 10% at one point during the year and only 8 of those years were able to finish in the green. This suggests that should this year close green, it would be in the minority. The largest reversals off the intra-year lows ever were from -20% to +46.6% in 1933 and -25.1% to +23.5% in 2009. 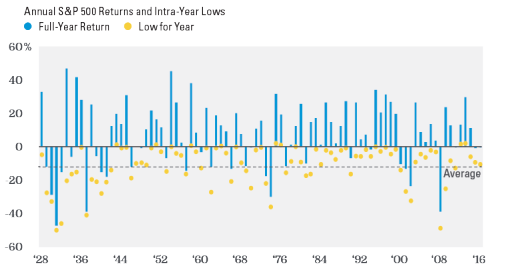 The low in 2013 was actually +2.2%, the “highest” intra-year low ever. The first day of 2013 gained 2.2% and that was the low for the year.